For a perfect holiday in Sardinia, before getting there you should stop and visit CharmingSardinia.com and plan the details of your holiday. Choose your accommodation from a selection of luxury hotels, far from the madding crowd of tourists. Even if you are a fussy traveller, you will find the 3, 4 or 5-star hotel suitable for you. Breakfast on a terrace facing a turquoise sea, private swimming pool and butler at your service are just a few of the luxury services you will find in the luxury hotels of this beautiful location. If this is not enough for you and you want to be pampered more, choose a spa hotel. Your body will be taken care of, so that you can relax and enjoy your time on the island. The many baby clubs in the area will take care of your children if you have a family holiday. Thalassotherapy, massage and various treatments will make you forget about the stressful working year you had. For golf players, Sardinia has the best golf courses along sandy beaches, surrounded by green nature: Pevero Golf Club or Tanka Golf Club are only two of the many golf courses in Sardinia. For some quality time with your family or friends a cruise around the island is the right thing. Cruise around Sardinia on a sailship, a yacht or a catamaran. At the end of an exciting day in Sardinia, take your time and enjoy a delicious meal or a cup of Italian coffee. CharmingSardinia recommends you a wide range of lounges, bars and restaurants: Aqua Lounge, Antico Caffe 1855, Ristorante Hibiscus or Ristorante Trattoria Balbacana. 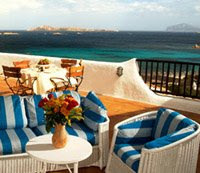 You can book online on www.CharmingSardinia.com and they will offer you the best options for your holiday as well as 24/7 on spot assistance.